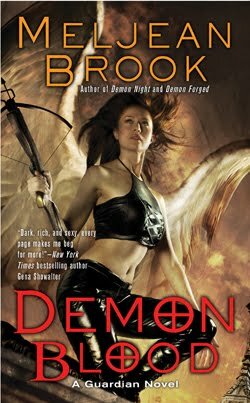 Meljean Brook just posted the preliminary cover to the 10th Guardians book - Demon Blood which is due for release July 6, 2010. 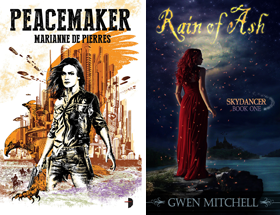 Meljean advises that there may be a few minor changes to come. She also talks about the cover art and artists she loves over at the Odd Shots blog today and about Cliff Nielsen the artist for this gorgeous cover. Long before she was transformed into a Guardian and trained to fight demons, Rosalia knew darkness all too well. Raised by a demon, Rosalia learned to guard her heart–and her soul–until she found a man worthy of her love. Once, she thought that man would be the powerful vampire, Deacon…until he betrayed the Guardians. Ooh, interesting cover. I've yet to read any of these books, I can't ever seem to find the first ones in the shops. Oh wow gapyeargirl123 are you ever in for a treat once you find the books. This is one hell of a series. Demon Moon is my fav.